One of the leading manufacturers of consumer drones is loosening the control it has over whether the craft can take off in restricted areas, such as near airports. DJI said on Tuesday that a new version of its drone control software to be released in December will allow pilots to fly in restricted areas after they have self-certified they have permission to do so. At present, DJI's software simply blocks the drone from taking off if it's found to be within a restricted area such as within 5 miles (8 kilometers) of an airport. "It's increasingly clear to us that a system governing the use of technology that relies on geographic location alone is not the right approach," said Brendan Shulman, vice president of policy and legal affairs at DJI, during a news conference in San Jose, California, on Tuesday. Shulman provided several examples where drones were successfully and safely being used by airlines and flying clubs close to airports with permission of the airport operator and by emergency services in natural disaster areas covered by temporary flight restrictions. To self certify, a drone pilot will need a DJI online account and have to provide one of two means of identification: a credit card number or a mobile phone number. They will also be prompted twice to confirm they have permission and really want to unlock flight in the restricted area. 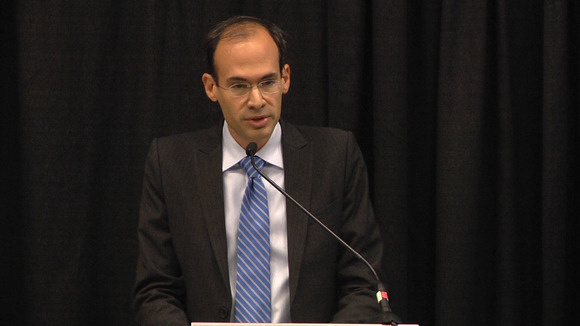 Brendan Shulman, vice president of policy and legal affairs at DJI, speaks at the Drone World Expo in San Jose, California, on Nov. 17, 2015. Should the flight prove problematic and law enforcement becomes involved, the information could be turned over, said Shulman. In addition to providing a new level of freedom for pilots, the software also brings an additional level of sophistication to flight restriction warnings. It will include not just areas such as airports and national parks, but also temporary flight restrictions, such as those imposed for VIP travel, major sports events and military exercises. Such temporary restrictions can sometimes be imposed with little or no warning, such as in the event of a natural disaster, and DJI will rely on a feed from Airmap to keep such data up to date. Shulman said some "security locations" will remain off-limits and pilots won't be offered the self-certification option. He cited Washington, D.C., as one such area and also said prisons and nuclear power plants would be included. He said DJI would work with government agencies involved in national security to determine those areas and wasn't clear about how they would be decided. 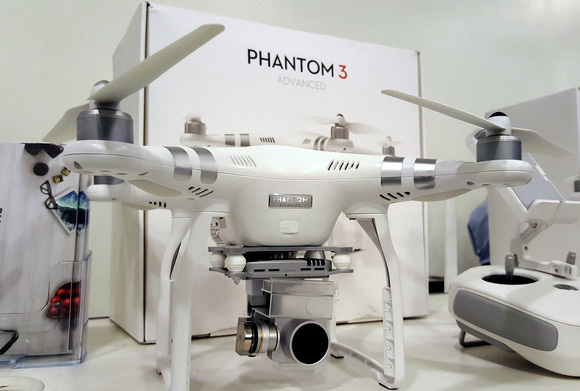 A DJI Phantom 3 drone on display in San Jose, California, on Nov. 17, 2015. The new software will be delivered in the run up to what's expected to be a bumper sales period for drones around the year-end holidays. DJI was one of the few drone makers to have mandatory no-fly zones programmed into its drones -- something that might have put off some potential buyers -- so the new software could go some way towards helping expand sales. It also recognizes the complexity of drone flight and pushes back against the Federal Aviation Administration's one size fits all regulations, which are likely to change as technology becomes more complex and more legitimate applications from drones are developed.